The name kenchinjiru (けんちん汁）derives from the Zen Buddhist temple where it was first made (or so it's claimed), Kencho-ji （建長寺）in the historical feudal town of Kamakura. Since kenchinjiru is a shojin ryouri or temple cuisine dish, the basic version given here is vegan. It's still very filling because of all the high fiber vegetables used. You could make a very satisfying vegan meal just from this soup and some brown rice. I got the ones in the photo some time ago from Nara Foods in Port Washington, NY, but I spotted three huge roots sold at H Mart for a mere 3 dollars (it may be called "u-eong", which is its name in Korean). Burdock root is supposed to make your body warm according to macrobiotic principles. I am not sure about the science of that, but who knows - it may account for why this low-calorie soup is as warming to me on a cold winter's day as a hearty beef bourgignon. Put the dashi stock in a large pot and heat it up as you prep the vegetables and so on. Peel the burdock root (a peeler is the most handy thing for this) and slice on the diagonal as thinly as you can manage. Put into a bowl of cold water to get rid of any bitterness, and to stop it from turning black. Peel the carrots and daikon radish, and cut lengthwise into half. Slice fairly thinly (thicker than the burdock, around 1/8 inch / 1/4 cm thickness). Cut the stems off the shiitake mushrooms, and slice the caps into halves or quarters. Alternatively, leave them whole and make a crisscross decorative cut on the top of the caps, as shown in the photo. 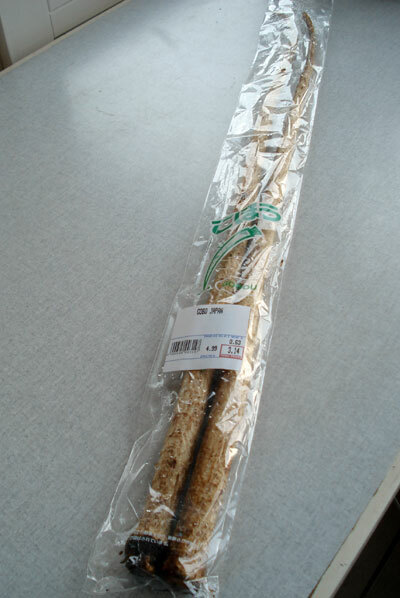 Take the konnyaku out of the packaging and drain off the smelly water, Cut in half lengthwise, then slice thinly. Blanch in boiling water for a few minutes, then drain into a colander. Peel the taro root or potatoes, and cut into chunks. Note that taro root is slimy, so leave this task until you've cut everything else up, since your cutting board will have to be washed afterwards anyway! Drain the tofu well in a colander, then put it in the middle of a clean kitchen towel or a few layers of paper towel. Gather the towel around the tofu, and squeeze gently to get rid of excess water. Open up the towel, and crumble the tofu up with your hands, so that it looks like scrambled egg. Heat up a large frying pan or wok with the sesame oil over high heat. Add the drained burdock root and stir fry for 2-3 minutes, then add the other vegetables, konnyaku and tofu. Stir fry for 4-5 minutes, put it all in the pot with the heated dashi stock. Add 1 tsp. salt, and lower the heat so that the soup is just very gently bubbling. simmer for 15 to 20 minutes until the vegetables are tender. Periodically skim off any scum that forms on top of the soup as it cooks. Top up with more dashi or water if there seems to be too little. Add the soy sauce, and taste; it may or may not need more salt or soy sauce. Add some if you think it needs it. Serve in large soup bowls rather than small Japanese miso soup bowls. My mother used to have a set of extra-large bowls just for kenchinjiru. 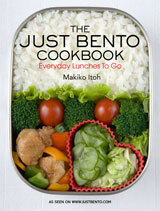 Optionally sprinkle on a little sansho or black pepper. As you can see, this is a clear soup, not a miso soup (not all Japanese soups have miso!) You can add miso if you like. Add about 3/4 cup of miso to start, and add more if you think it's needed. Omit the salt and reduce the soy sauce to 2 tablespoons. If you add about 3 oz / 100 g of thinly sliced pork, cut into 1/2 inch / 1 cm pieces, to this dish instead of the tofu, it becomes tonjiru or butajiru （豚汁), which literally means 'pork soup'. Tonjiru is usually a miso soup, (follow the miso variation above) but it can be clear too. Add the white part of a leek, sliced, to the vegetable mix. Many people like to add sliced chikuwa or other fish paste products. See my oden post for more about these fish paste products, called nerimono. If you do use chikuwa or similar fish product, use a traditional bonito flakes based dashi stock instead of the vegan dashi. You can use turnips instead of the daikon radish, and sweet potatoes instead of the potato or taro root. Sliced onions can be a sweet addition, or use finely chopped green onions as a garnish. Add ground or chopped up chicken instead of or in addition to the tofu. The traditional way of cutting burdock root for this dish is to shave it into thin slivers, rather as you would sharpen a pencil (this is called sasagaki; burdock cut like this is called sasagaki gobo). This can be a bit tricky to do unless you have a very sharp knife, so I just slice it thinly instead. Submitted by maki on 2009-12-22 10:01. Will definitely try this one out after Christmas. I always feel the need to detox from all the sweets I eat on Christmas day. Just need to find burdock root. This was great. Perfect start to Christmas holiday excess. It is cold and the sidewalks are icy here in DC, but I went to 17 and U to get some gobo and stock up on non-recipe supplies. Made it Wednesday night. Fabulous. Will probably become a winter staple. How do you think it would be with parsnips substituted for the burdock? It sounds lovely and easy. We will try the pork version (Keiko says it is her favorite soup) and see how it goes. Would be nice on one of these cold days. This soup is better for cold days and winter. 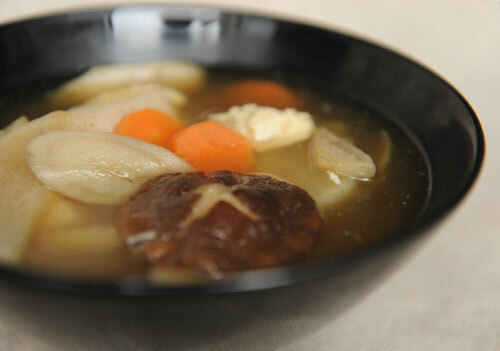 It is always delicious to sip a bowl of hot soup in the cold season. Plus, the recipe does not require you to rent a car just to purchase the ingredients. The ingredients are quite easy to find, so there is no need to mind some renter's insurance policy. Time for a hot soup guys! I wish i could get burdock root here..can not find it anywhere. Also i would find buddhas delight very interesting,all the different strange vegetables like the algae which looks like human hair ...or daylilly buds. I have discovered that the daylillies we have in our garden can be eaten..i will defenitely try them..and also the fern which grows here like weed. The fern is always growing beyond the place where it should be, so i will harvest the ones that would be taken away anyway and cook them. This autumn i saw the fertile leaves on them and could pinpoint the species as an eadable one. Maybe fiddle heads would be good as an tempura? Have you ever tried it? Oh, yum! Definitely have to make this one. I'm a huge fan of burdock so another amazing stew recipe incorporating it is just the thing right now... Going to try changing it up a bit by adding some seitan instead of the konnyaku! Lucky for me burdock is only $3 a bag on the west coast of Canada. I just made this soup, followed your directions exactly and am now struck with an unusual (and nasty) problem that I was hoping you could help me with. I have bugs in my soup. Little, winged bugs that almost look like fruit flies all throughout my soup... EWWWW!!! Eww indeed! I have no idea where they came from...I have never seen insects like this in burdock, though I've seen them sometimes in rice and other grains. Maybe check all of your dry goods! Its the dashi. I just opened mine to boil some packets, and it was infested with little bugs. Thanks for the wonderful recipe! I made this last night and it came out very well. I started reading this blog so I could learn about new ingredients to try. Both the burdock and tofu were new to me. (I've eaten tofu before, just never actually prepared it.) I had to use frozen burdock because it's all I could find. It worked nicely and I have a bunch leftover to try other ways. I wanted to try konnyaku too, but it wasn't available here. I subbed sweet potatoes for the taro and turnip for the daikon, and used homemade broth. The soup was filling and delicious. Thanks and I look forward to trying more of your recipes. The name _kenchinjiru_ (けんちん汁）derives from the Zen Buddhist temple where it was first made (or so it's claimed), Kencho-ji （建長寺）in the historical feudal town of Kamakura. Since kenchinjiru is a shojin ryouri or temple cuisine dish, the basic version given here is vegan. It's still very filling because of all the high fiber vegetables used. You could make a very satisfying vegan meal just from this soup and some brown rice. If you add about 3 oz / 100 g of thinly sliced pork, cut into 1/2 inch / 1 cm pieces, to this dish instead of the tofu, it becomes _tonjiru_ or _butajiru_ （豚汁), which literally means 'pork soup'. Tonjiru is usually a miso soup, (follow the miso variation above) but it can be clear too. Add the white part of a leek, sliced, to the vegetable mix. Many people like to add sliced _chikuwa_ or other fish paste products. See my oden post for more about these fish paste products, called _nerimono_. If you do use chikuwa or similar fish product, use a traditional bonito flakes based dashi stock instead of the vegan dashi. * You can use turnips instead of the daikon radish, and sweet potatoes instead of the potato or taro root. Sliced onions can be a sweet addition, or use finely chopped green onions as a garnish. * Add ground or chopped up chicken instead of or in addition to the tofu. The traditional way of cutting burdock root for this dish is to shave it into thin slivers, rather as you would sharpen a pencil (this is called _sasagaki_; burdock cut like this is called _sasagaki gobo_). This can be a bit tricky to do unless you have a very sharp knife, so I just slice it thinly instead. Japanese characters. I'm trying to learn Japanese via self-study and you seem to be fluent in both English and Japanese. I don't know if you know anything about grammar in Japanese, but if so, I could really use your help; this is my weakest part of Japanese. I'm also fascinated and interested in the cuisine and culture of Japan. Thanks, I will definitely try this. I need some detoxing. Is it important to stick with shiitake or can I substitute a less expensive mushroom? For authentic flavor you would want to stick to shiitake, though of course any recipe is just a starting point for you to experiment with! Hi, I was wondering if I could substitute taro for nagaimo? I think their textures are quite similar. I currently live in Japan and have gone to a couple of french restaurants that have served a delicious gobou/potato soup. I haven't been able to find a recipe such like. Do you have any idea what they might have put in it? I am becoming a fan of gobu. I love this soup! I have made it several times now, and each time it gets better. I can find all the ingredients at my favorite Asian supermarket, which has a huge selection of Japanese products. It's the only place that I know I can find konnyaku and gobo root. It's a bit much for one or two people, so I freeze the leftovers in individual sized containers. By using gluten-free soy sauce, I have a new meal for my vegan, celiac friend, and she loves it too.